After my search on Google to find out more about Bang Lon Island off Nha Trang City was pretty much fruitless, I decided I had no more reason to hesitate. I was off to the island to find out for myself. At 7 a.m. at the private wharf of Nha Trang Bird’s Nest after a breakfast portion and a cap, we stepped upon the boat with much excitement like little boys who are going to take an adventure into a strange world. The boat tore waves and glided fast and smoothly while everyone on board enjoyed the view of the splendid surroundings, small sponges as well as fishing boats sailing in the distance. Sometimes we looked back to Nha Trang City to see how beautiful our city is and to catch the busy ambiance of hundreds of boats anchoring on Cau Da tourist wharf. The path was scattered with many fishing boats, giving our cruise passengers more of a mutual understanding and respect about the hardships of having the career of a fishermen. The boat cruised over Hon Tre Island which looks like a giant crocodile stretching its body to the sea to protect Nha Trang City. Hon Tre covers about 3,000 hectares and it has about 1,500 residents. We had a glance to see Con Se Tre Tourist Site and Vinpearl Land on our 45-minute journey. Finally we reached Bang Lon Island which has many bird’s nests of swiftlets tucked in mountain walls studded with some tents of those who raise swiftlets on sheer and hazardous cliffs and rock walls. Bang Lon Island is about five kilometers wide and is one of the cluster of Hon Tre Islands. It used to be a shooting yard for the military. 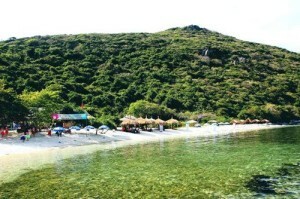 The island has a beach where tourists can swim and admire pebbles under the pure water. The sandy beach is smooth and white and unpolluted. There are many rock beaches where visitors can take many photos and take a rest. The interesting thing is that the island has many fruit trees and many kinds of vegetables. From the island, travelers can continue their trip on motorboats to other islands.